Jealous of everyone's snowy pics! We were ripped off last week! Thanks for stopping by. excellent snowmen!! have they melted yet? Thank you. The little ones were upset that their new friends disappeared! 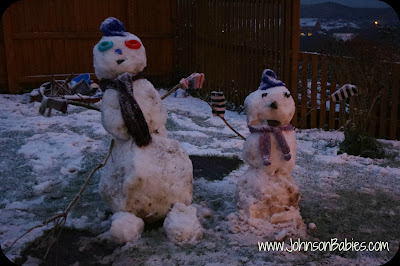 Good evening Mummy and Daddy snowmen! They look like they took some building, but I bet it was outside time much enjoyed. Do join me for Country Kids too. Lovely to see you! Mr J is a pro at the snowman building, but they were much loved whilst they survived! Yep, snow up North was much better! Yep, we had lots of promises of snow so was well received when it finally arrived! they look brilliant, I love the bigger one's eyes.